“It is a landmark building that people take pictures of and we need to explain to these people what kind of business this is here with a balance of many different sectors and the parking here is fantastic as well as the location”, Bob Addison explains, who is as a Country Manager of real estate advisory firm DTZ responsible for the BWTC facility maintenance and residing himself in the tower. The BWTC, a twin tower complex which looks like a pyramid, is conjoined by three wind generator turbines. 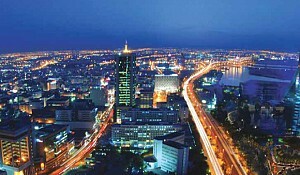 They are capable of covering 15 per cent of the building’s energy consumption. It is of no surprise, that banks and asset managers have discovered green investments, too. “Speculatively, out of four energy deals, at least one or two of them are alternative energy based in Bahrain,“ says Ahmed Al Khan, Head of Investment Banking at Global Banking Corporation (GB Corp) in Manama. “It has become an opportunistic sector, because with Obama’s initiatives and people seeing how their ecosystem is being deteriorated, an opportunity arises,“ Mr. Khan explains. The trend to green energy and sustainability has also reached the Bahrain industry and as the example of The Bahrain Petroleum Company, dubbed BAPCO, shows. “We have invested 400 million dollars on projects which have no economic return but they are solely for the environments sake”, says BAPCO’s CEO Abdulkarim Al-Sayed (picture below). 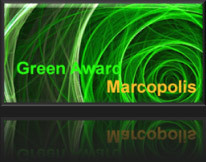 BAPCO - MarcoPolis' green award winner - is wholly owned by the government of Bahrain. The firm is engaged in the oil industry including exploration and prospecting for oil, drilling, production, refining, distribution of petroleum products and natural gas, sales and exports of crude oil and refined products. For BAPCO, environmental protection goes beyond reducing emissions and recycling waste. “Environmental health and safety week at our company is also important for both our employees and their families and we educate them too on these important issues and this has been a major success with 22,000 people in attendance most recently. Our concerns with the environment do not end with the boundaries of BAPCO,” CEO Al-Sayed says. The company owns a 250,000 barrel-a-day refinery. It hosts storage facilities for more than 14 million barrels, a marketing terminal and a marine terminal for its petroleum products. The idea of keeping a safe and clear world for next generations does not stop at BAPCO. 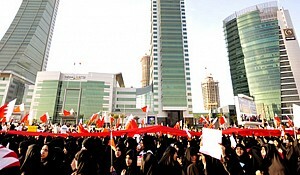 It is almost unknown to the outer world that Bahrain industry includes steel- and aluminum producing factories. 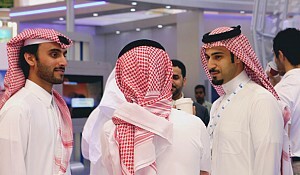 ALBA, for example, is short for Aluminum Bahrain a flagship of Bahrain industry. Marcopolis spoke to ALBA’s CEO Ahmed Saleh Al Noaimi, who shared his company’s contribution to sustainability with us: “We’ve spent on the plant for more than 17 years, it is more than $600,000,000 on environmental projects and we have a list of each and every project. Earlier this year we completed our project on the old power station; although it is within the international standards on emissions we figured we could do better than the international standards, and with a project of $63,000,000 it is now almost emission free”. Gulf Aluminium Rolling Mill Company (GARMCO) is another player in the Bahrain industry. “In Bahrain we have 850 and about 300 worldwide so we are in the range of 1300,” says its CEO Dr. Adel Al Rahman. 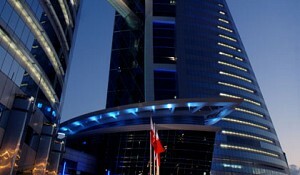 That building modern skyscrapers and a sense for environmental protection do not need to exclude each other can be seen at the Bahrain Financial Harbour (BFH). Manama’s stylish “Wall Street in Seawater”, easily accessible from the famous Diplomatic Area, was planned and built based on an environment impact assessment. Having a heart for the environmental does not mean reducing the quality of life either, becomes clear when looking at the BFH’s facilities. Studies were conducted to minimize the impact on the marine life. Computer-aided programs showed how the waves would break once the harbor was completed. The harbour-concept also reduced the impact on Manama’s car traffic compared to a new financial city that would have been built in the heart of the capital. The $1.5 billion BFH with its distinct new architectural look was planned in 2003, and eventually inaugurated in June 2007, with a spectacular laser light and luxury show, watched by 350 high-profile guests, including Prime Minister Sheikh Khalifa bin Salman Al Khalifa.